In an immaterial world that is constantly being built up and expanded, net.artists from around the globe must work to carve out space in an all but concrete landscape. But, what happens in these caves of innovation, anarchism and unregulated creativity is quite exciting for Latin American artists; who have oft been pushed to the outer recesses of the Western-centric art historical canon. The hybridized art form that is bnet.artb draws affinities with visual arts, poetry, performance and more. It may be a site for revolutionary social and political commentary that would otherwise be censored. Admittedly, the internet is not without its flaws; skewed regulations of access in some countries, falsified information, nameless and faceless internet btollsb, all plague the cybersphere. However, in between pockets of misconduct, the internet provides artist with a free ground on which to establish and disseminate their work by themselves! Why is this so exciting? With the advent of the world wide web artists become able to challenge the role of the institution in entirely new ways. Net artists are able to directly provoke the traditional role of the curator by sidestepping the intermediary and exhibiting their work themselves, online (Diamond 2005). Something unprecedented began to happen in the art world; “the environment that provided [artists] with the material for their artistic practice also was the space in which this work was 'exhibited’” (Diamond 2005). One such artist, who is able to overturn the role of the curator and generate his own unmediated online art content is Brian Mackern, a Uruguayan media artist, developer and designer of digital and hybrid net based art projects. Mackern’s net.art practice directly critiques urban geographies and cartographies as well as Western representations of Latin America. .
An alternative to physical institutional spaces of galleries and museums, the internet provides opportunities for artists to generate their own content, though the world wide web is not without its problems. Hegemonic structures, internet policing and access to technology plague the bfreeb space with rampant inequalities. A lack of visibility for Latino artists is one key problem Mackern seeks to address through his Netart Latino bdatabaseb (2000-2005). While by no means a comprehensive survey of Latin American net.art, the database is a personal project for Mackern that draws attention to works that didn't make it into the canon, or, in his words, were not ”heroes” of the burgeoning latino net art scene. Netart Latino bdatabaseb is a simplistic site emblematic of the 1990s net.art movement during the early staged of HTML development and coding. 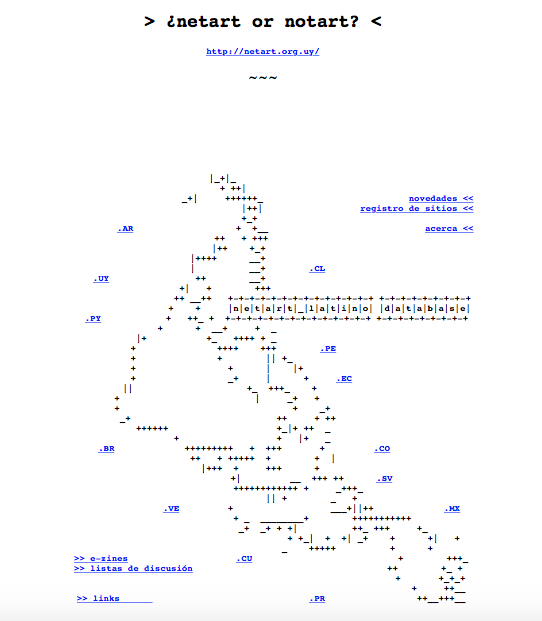 The database links are scaffolded by an inverted image of South America that has been composed of symbols, specifically using the ASCII graphic design technique. Scrolling over the map areas such as Argentina, Venezuela, and Ecuador, for example, provide highlighted links to areas of the one page database website. Clicking on .AR, the section of Argentina, the user is propelled down the page to a list of key links to Argentina net.artists and their work. Torres Garcia’s map is a subversive critique of northern, American powers and influence on the south. The map is decontextualized through inversion. This act may be a call to separate Latin American art history from the western dominated hegemonic art historical canon in favor of further developing and celebrating contemporary Latin American Art. For Mackern, Torres Garcia’s inverted map was an excellent point of departure for creating a database of Latin American art. The subversive map literally turns hierarchical structures upside-down by overturning the structured implications of mapping. By flipping the iconic shape of Latin America oppositions are turned on their head, presenting possibilities of an interaction between North and South that is not plagued by problematic colonial histories. Mackern plays with “poor” (low-tech) designs to create his database. ASCII, a graphic design technique that uses 95 easy printable characters to simply produced images based on limited graphics and facilitated reproduction and printing for images. Letters, numbers, punctuation and symbols are melded together to create the illusion of a larger image, in this case an invented map of Latin America. Mackernbs ASCII map is a hybridized inversion of mapmaking that expands Latin American perspectives, using online media as a mode of decontextualizing space from problematic colonial histories and reframing Latin American history. The unbound online database, with is inversion and low-tech aesthetic push the boundaries of knowledge sharing. Mackern places himself as the helm of history recording through the malleable and maker-generated content of net.art to create a symbolic, aesthetic and generative database. .
Diamond, Sara, "Participation, Flow, and the Redistribution of Autorship: The Challenges of Collaborative Exchange and New Media Curatorial Practice", Museums and the Web International Conference, 2005. On line. .
About the Author Treva Pullen is an interdisciplinary researcher, curator and artist from Toronto currently based in Montreal. Her writings on the subject have been published in JAWS and AlterNative: An International Journal of Indigenous Peoples. She has also curated new media based exhibitions such asB #NATURE (2016) and Influenc(Ed.) Machines at OCAD University and was research assistant for the exhibition Lively Objects (2015) at the Museum of Vancouver. Pullen also acted as managing coordinator for the 2016 Contemporary Art, Design and New Media Art Histories Graduate Conference “#trending: mobilizing art and culture”. Pullen holds an MA from OCAD University in Contemporary Art, Design and New Media Art Histories, and a BFA from OCAD University majoring in Criticism and Curatorial Practice. Her recently published Master’s Thesis “Whimsical Bodies: Agency and Playfulness in Robotic Art” won OCAD University's Outstanding Thesis Award in 2016. Pullen is currently a PhD candidate in Communication Studies at Concordia University. .